President Obama’s visit next month to four East Asian allies and partners almost certainly will feature conversations on how to deal with Chinese incremental territorial expansion at its neighbors’ expense. Japan, South Korea, the Philippines, and Malaysia are all disputants in recent territorial issues with China. The president faces a rising tide of concern at home and in the region; the focus of concern stresses that the United States government needs to articulate and implement a “strategy” for dealing with China’s so-called “salami slicing” tactics featuring the use of intimidating and coercive means that do not involve the direct use of military force that would warrant a strong American military response. In short, how will the United States deal with China in this “gray zone” between war and peace in East Asia’s disputed seas? The Obama government has continued the rhetorically tougher stand against Chinese policies and practices in the disputed South China Sea and East China Sea begun in January that was highlighted in the February 2014 posting. Assistant Secretary of State Daniel Russel told the Senate Foreign Relations Committee on March 4 of the administration’s firm opposition to China’s pattern of “coercive behavior, strident rhetoric, and ambiguous claims” leading to instability and uncertainty. He added that while he believes China and other disputants do not seek armed conflict, unintended incidents and accidents risk escalation and conflict. The hearing featured various options for US policy offered by American specialists, but no clear consensus on what should be done. There was strong support for reinforcement of American engagement with the region, militarily, economically, and politically—along the lines of the Obama policies and practices under the rubric of the administration’s “rebalance” toward the Asia-Pacific. Thus, the president and Congress were urged to follow through with planned military deployments to the region; to complete the promised TPP FTA seen strengthening American economic engagement with the region, and to interact actively with regional leaders, as the president will do in the April visits. There also was support for measures that would underline for China the “costs” Beijing will incur by continuing its coercive and expansionist actions. Registering such costs represented a means to deter China from continuing its assertive practices in disputed seas, according to those at the hearing. Such measures involved deepening American security presence with allies and friends concerned with Chinese assertiveness. American military expansion along China’s periphery has long been sensitive to China and was seen likely to get the attention of the Chinese leaders and presumably reduce Chinese assertiveness on territorial issues. Also recommended was support for the Philippines’ legal challenge regarding China’s ill-defined and broad claim to the South China Sea. And working with Japan in challenging China’s ADIZ over contested seas should be followed by prominent US complaints whenever China takes coercive and intimidating actions at odds with regional interests in stability. Such complaints were seen to undercut Chinese regional influence and to work to the advantage of the United States. At the end of the day, however, it remained uncertain as to whether and how such steps would actually curb strong Chinese impetus toward continued incremental expansion. As Forbes noted, the outlook of “perpetual low-level contestation” represents a serious challenge for US interest in regional stability. Demand grows for an American strategy that considers the variety of American strengths, policy levers, and interests. 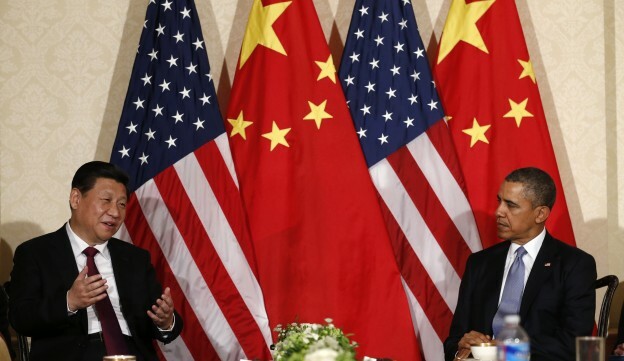 The recent toughening in the Obama government rhetoric against Chinese assertiveness is welcomed, but a more coherent and clear direction in policy is needed. Only the Executive Branch has the full awareness of the strengths of US military, intelligence, economic and political assets, and relationships in Asia to be in a position to come up with a comprehensive and coherent assessment of what can and should be done to deal with China in the gray zone between war and peace in Asia’s disputed seas. Obama’s visit to Asia provides an opportunity to articulate a strategy to deal with the problem. Without it, ambiguity and uncertainty by all concerned will continue to add to regional instability. The content of the US strategy should have three major elements. US military presence must remain strong as promised by American leaders. Congress needs to support Trade Promotion Authority, allowing Obama to conclude his planned TPP FTA and thereby deepen economic integration with Asia. The president and cabinet leaders need to continue to travel regularly to Asia to show the government’s commitment to vigorous engagement. The already broad and generally welcome American security presence can be strengthened with many of China’s neighbors anxious over China’s coercive tactics on disputed territory. The lesson for China in this case is indirect but obvious—the more it pursues coercive measures, the greater American security integration along China’s rim. Meanwhile, the American image as a cooperative regional partner following broadly accepted international norms would be enhanced by Senate approval of the Law of the Sea Treaty. China’s self-serving policy toward North Korea has enabled repeated provocations by Pyongyang threatening neighboring countries and raising regional tensions. These outcomes are at odds with broad regional interest in stability. The US government should repeatedly press China to bring its policy in line with regional efforts to curb North Korean threats. If China joins the United States, United States policy will be strengthened; if China refuses, it will be shown to all as adverse to broad regional interests, undermining China’s influence. China’s uniquely self-righteous pursuit of territorial ambitions at the expense of its neighbors has involved repeated coercive and intimidating actions well beyond international norms generally adhered to by regional governments. The US government should give high priority to calling out China on these wide deviations from world norms. It should repeatedly highlight China’s egregiously broad claim to the South China Sea as questionable and probably unwarranted under international law. It should focus on Chinese naval exercises and other shows of force in sea areas claimed by weaker neighbors for what they are—exercises in intimidation. Whenever China pursues its claims, as it periodically does, with gross violations of international norms involving unilateral trade closures and mass demonstrations and associated violence, the US government needs to speak out strongly and encourage allies and partners to join. Such publicity and the likely self-absorbed indignations of China’s reaction will show to all concerned how China fits poorly with the priorities of regional governments seeking stability and development, and thereby weaken Beijing’s regional standing. Chinese military forces have advanced area denial against American forces, but they remain weak and vulnerable in several areas, notably anti-submarine warfare. Against this background, American forces can respond to China’s assertive steps in disputed seas with actions that fit within the broad framework of collaboration with allies and partners but send signals likely to register strongly with and presumably deter China. In 2010, the United States conducted a surprise simultaneous surfacing of three SSBN submarines converted to carrying cruise missiles and known as SSGN, in seas near South Korea, the Philippines, and Diego Garcia.5 These very large submarines have conventional fire power that can launch barrages of missiles that would quickly annihilate surface combatants or forces on islands. A replay of the 2010 surprise resurfacing could be done in the East China Sea and the South China Sea. The converted SSBNs could be accompanied by one of the US advanced attack submarines, and perhaps a submarine or two from Japan and/or Australia. As in the case of the 2010 surprise resurfacing, little government publicity needs to be devoted to the event. Strategic planners throughout the region will get the message clearly—China has no match for these weapons systems and should proceed with caution in challenging US interests in regional stability. 1. “Testimony of Daniel Russel, Senate Foreign Relations Committee,” March 4, 2014. 2. “Philippines lodges protest over ships ‘blocked’ by China,” New Straits Times, March 11, 2014. 3. “Japan, US differ on China in talks on ‘grey zone’ military threats,” Reuters, March 9, 2014. 4. “Hearing on China and the Evolving Security Dynamics in East Asia, US China Economic and Security Review Commission,” March 13, 2014. 5. Mark Thompson, “US Missiles Deployed Near China Send a Message,” Time, July 8, http://content.time.com/time/nation/article/0,8599,2002378,00.html.